Kevin Carson coined the useful term "vulgar libertarianism" to mean the fallacy of equivocating actually existing capitalism with the ideal of stateless laissez faire capitalism. Carson uses the term mainly to castigate libertarians who assume, just because a economic outcome exists, that it came about through free market mechanisms. He argues that various existing patterns, e.g. third-world "sweat-shops" of multinational corporations, came about through massive governmental intervention. Although the term is used mainly by the libertarian left to describe "right" libertarians making the assumption that situation X came about through free markets, the fallacy is equally applicable to socialists who assume that situation Y, arising in actually existing capitalism, implies some flaw in stateless capitalism. One prominent example is Naomi Klein's book The Shock Doctrine, which claims that the Pinochet regime demonstrates the failure of laissez faire capitalism. I will assume that readers here know the difference between statist capitalism (aka corporatism or fascism) and stateless capitalism. Let "vulgar anti-corporatism" refer to the error of lumping all corporations into the political corporatist pot - in other words, assuming that all corporations receive significant benefit from collusion with state. In fact, most corporations do not enjoy significant special favors, suffer net harm from the state, and are put at a disadvantage compared to competitors receiving state privilege. One would think it obvious an Apple is not a Halliburton, a Wal-Mart is not a Bechtel, and that Ben-and-Jerry's is not Blackwater. Yet a surprising amount of literature, and an amazing number of people fail to make the distinction. Typically among anti-capitalists, all corporations are painted as in cahoots with the state, and benefitting from the state. Logically, since the state's plunder and redistribution is a zero (or rather negative) sum game, everyone can't benefit. In reality, only a relatively small number of individuals and firms can benefit from such spoliation. For every corporation that benefits from government privilege, there are hundreds if not thousands which get screwed. Some can be seen, such as the oil companies and security firms who don't get the lucrative government contracts or special favors. But we shouldn't forget what is not seen - the firms that would have existed had capital not been diverted to the homeland security industrial complex or the drug prohibition industrial complex, or for occupying foreign lands and killing people. Practically, we can distinguish between these firms by calculating what part of their income is due to government favors and contracts. (1) If a large percent of a corporation's income comes from government payments or contracts (e.g. 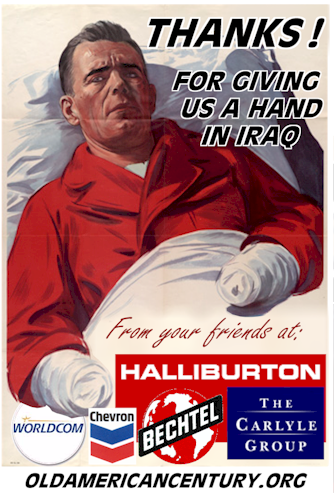 Blackwater and Halliburton), then that corporation is almost certainly a political corporation. (2) If a corporation would likely not exist without state directives or decreed law, then again that corporation is almost certainly a political corporation. (3) On the other hand, if a corporation gets the bulk of its income from producing or distributing things that people voluntarily buy, then it is almost certainly a market corporation. Of course the line between political and market corporations is fuzzy. While we can tally up government contracts, it can be difficult to gauge indirect state-generated benefits such as de facto transportation subsidies resulting from wars for oil. It is also true that many corporations get some benefits from the state - but generally not a net benefit. The inspiration for this new term - vulgar anti-corporatism - was a video called The Story of Stuff. The narrator, Annie Leonard, puts all corporations into the corporatist-political class without a second thought. But I don't really want to pick on her - as I noted, many anti-capitalist types seem to make the same mistake. Are you a vulgar anti-corporatist? Here's an acid test: Do you think Wal-Mart is a "bad" corporation like Northrop Grumman or KBR? If so, you are probably a vulgar anti-corporatist. You might criticize Wal-Mart for some of its policies. You may like to see it unionized, or use better environmental practices, or stop underselling small local firms. But to put Wal-Mart is the same class as Halliburton is a gross mistake. By our three criteria, Wal-Mart is clearly a market enterprise. (1) It receives little or no income from government contracts - it receives only incidental government benefits, mainly the usual local tax-abatement or TIF subsidies that all businesses attempt to win. (2) Retailing consumer goods would exist without the state, and (3) people voluntarily buy stuff from Wal-Mart at their "always low prices." To avoid the vulgar anti-corporatist fallacy, we must learn to use adjectives such as "political" and "market" before "corporations" as appropriate. E.g. Instead of "Corporations are in cahoots with the state," say, "Some corporations are in cahoots with the state" or "Political corporations are in cahoots with the state." Explicitly acknowledge the difference between producers and parasites - between market entrepreneurs and political entrepreneurs. Otherwise, you throw the baby out with the bath water.